How to keep your horse healthy, hydrated, and comfortable on long-distance trailer rides. Q: How often do you need to stop and offer your horse water during a long-distance trailer ride? And how often should horses be allowed off the trailer to stretch their legs? A: As you suspect, trailering is not only stressful for horses but requires quite a bit of energy expenditure to maintain balance during stops, starts, turns, and even just going straight. 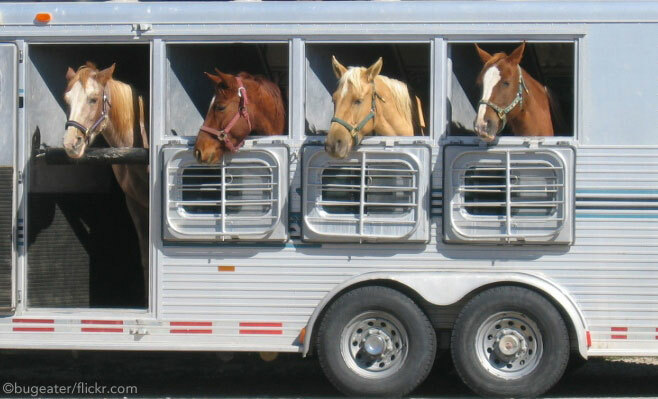 Experts such as in the resource I consulted—Guidelines for Horse Transport by Road & Air, edited by Catherine A. Kohn—suggest riding in a trailer uses as many calories as walking and twice as many as resting! Since weight loss, dehydration, and fatigue are real concerns then, what advice do these same experts give regarding feeding, watering, and resting? Their guidelines are to haul not more than 12 hours at a time; no more than 8 hours in one stretch is preferable. Then, your horse needs 8 (or 12) hours of rest OFF the trailer. Of course, you’ll want to check on your horse more often than that–ideally every four hours–by stopping for 30 minutes without unloading. Try to bring your own hay, grain, and even water for the duration of the trip. Hay should be soaked to reduce dust, grain should be limited, and water should be offered every four hours (when you stop to check on your horse). Handy tip: a water caddy is an excellent method of encouraging horses to drink on the road by providing water from home they’re used to. One more thing: don’t forget a recovery period once the trip is complete. For short trips (less than three hours), turnout in a paddock or handwalking once you get there may be sufficient. But for longer trips, consider giving your horse up to three days to get back to normal before asking for any work. Dr. Lydia Gray is the Medical Director and Staff Veterinarian for SmartPak Equine in Plymouth, MA, where she directs the research and development of products and provides horse health and nutrition education to a wide variety of audiences. Dr. Gray’s work has appeared in more than a dozen general and trade publications and she speaks frequently around the country. She is the proud owner of a Trakehner gelding named “Newman” that she competes in dressage and combined driving. Does My Horse Have Frostbite?